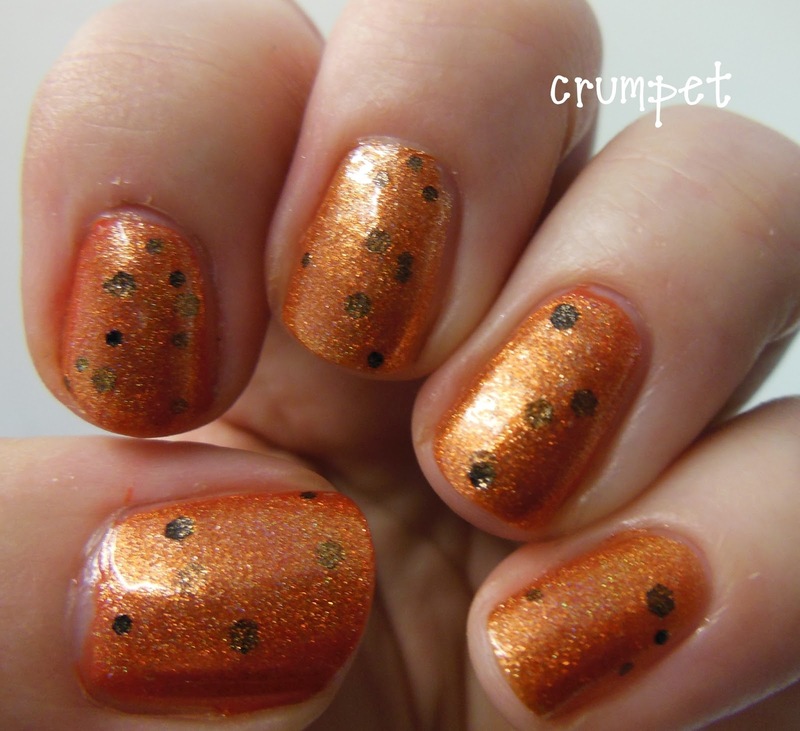 The Crumpet: Orange Swatch Spam! I'm going to be making a conscious effort over the next few weeks to really clear out some of the stuff in the vault. 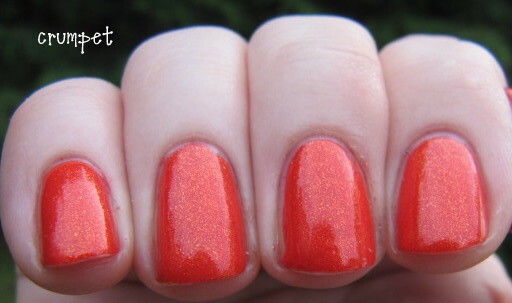 I think the oldest swatch I've found is from May! Lol! 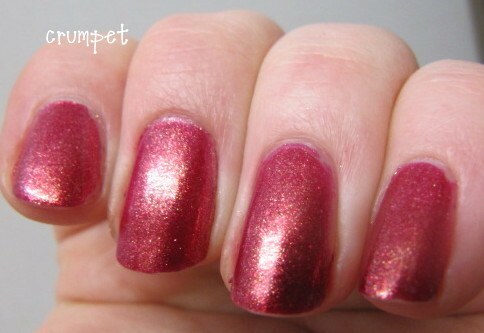 I don't deliberately send them to the vault to die, I just think I look at the finished mani and realise I have nothing to say. And now that I've changed my lighting set up .... well, it's going to be a dead giveaway if any of these resurface now lol. 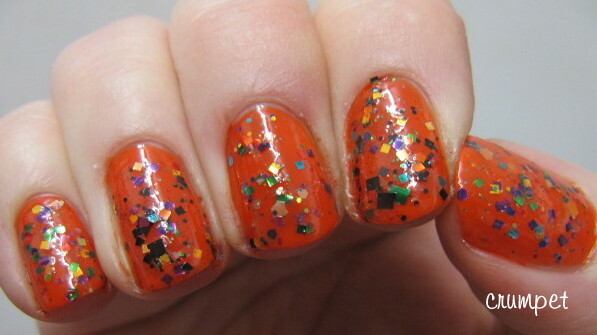 First up - Slutty Pumpkin from Darling Diva Polish. 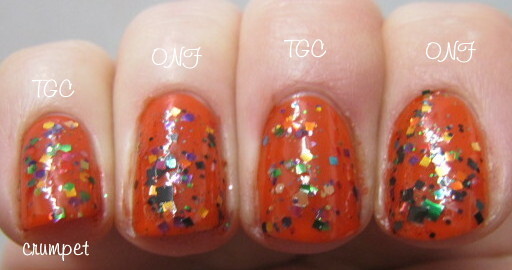 A brand I love, a hilarious polish name, and a polish named after my big fat cat ? I thought this was a guaranteed winner. Sadly, I didn't like this one on me. 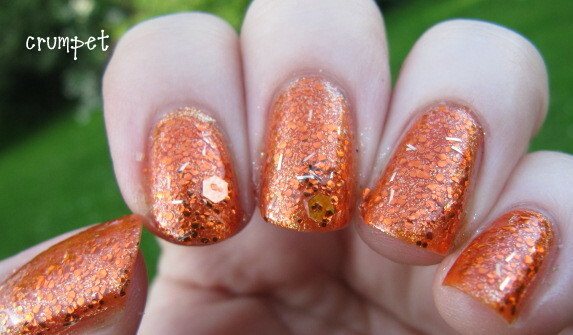 I found the orange a little muted, although the holo effect was good, but more than anything, the glitter just distracted me. 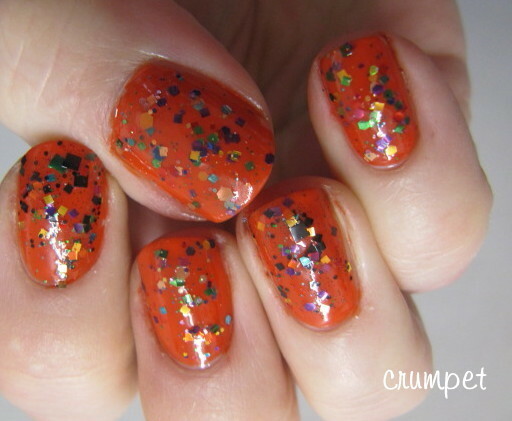 The thrill of holos (for me, anyway) is watching the dance of the rainbow, and the glitter felt like an intrusion that stopped me feeling that. 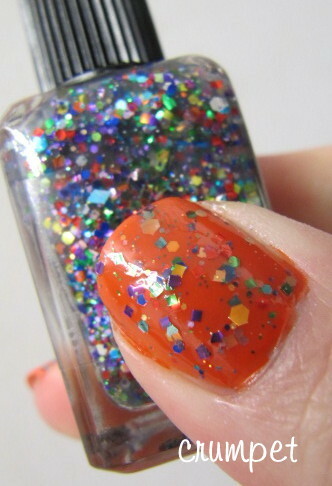 Next is Color Club Sparkle and Soar from last year's summer collection - gorgeous. Hot and icy at the same time. 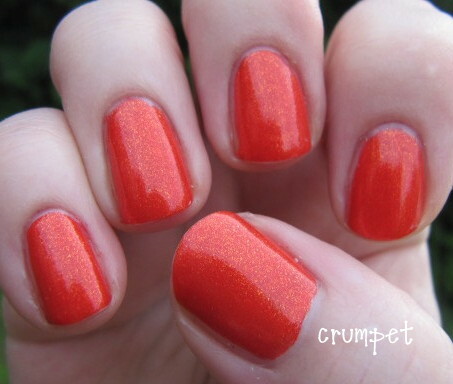 Pretty much the perfect summer polish. Hideous photos though! Ugh! 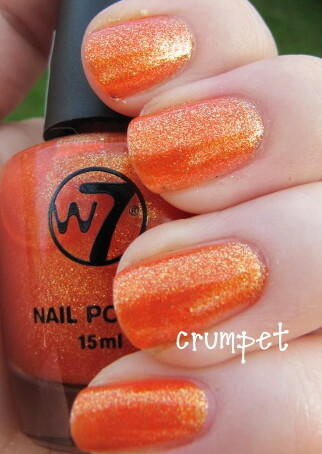 And then here is the w7 dupe - Sunset Island. As you can see, it has less subtlety and also less yellow. 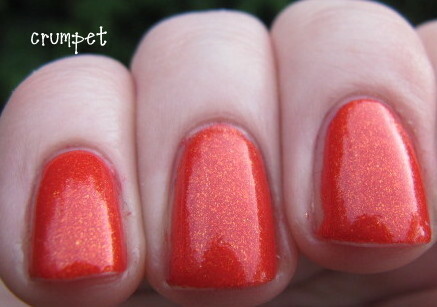 I then layered this with an orange Red Carpet Lacquer polish - I can't remember the name of it now. 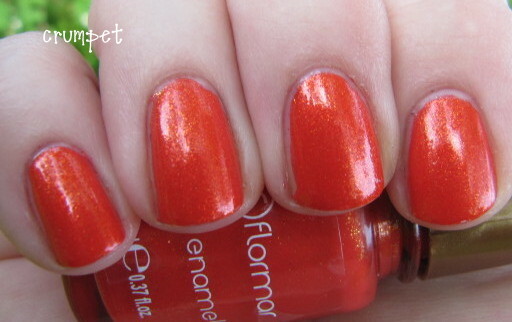 Then we have a Flormar polish I got in a swap. 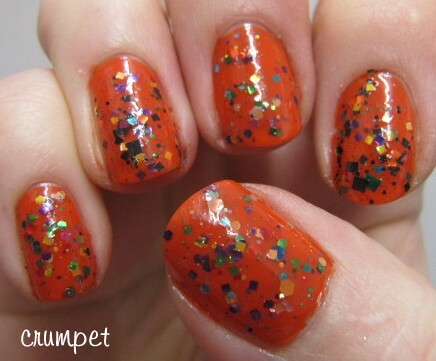 Doesn't this dazzle! 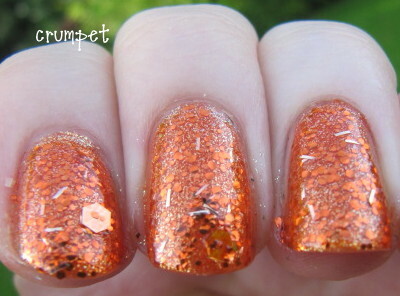 This is Jewel Gold JG453 and I feel like I bought a lot of polishes "similar" to this last year - stunning, and flecked with gold. 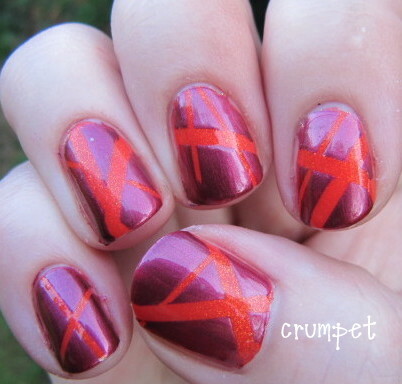 And then for the hell of it, I did a tape mani, but I can't remember what the darker colour is. 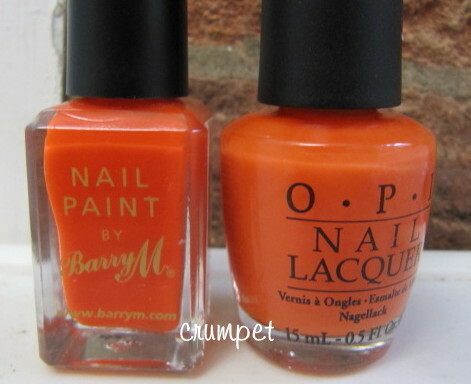 Bad Crumpet. 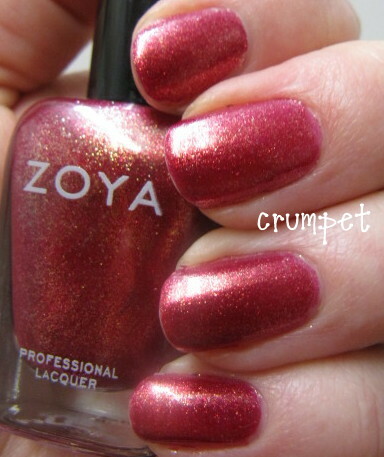 This is Zoya Reva, not an orange, but she has her heart in the same place! I didn't like this at all. 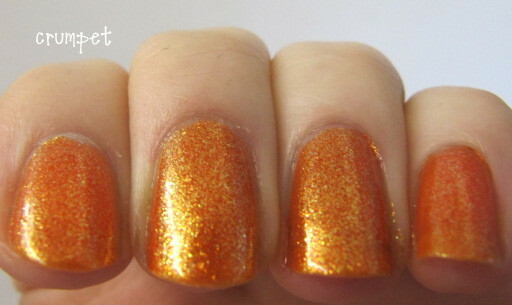 I really don't like these colours with gold foil bases, even though they look great on others. And then finally a Lynnderella post I had prepared before the Midsummer brouhaha. 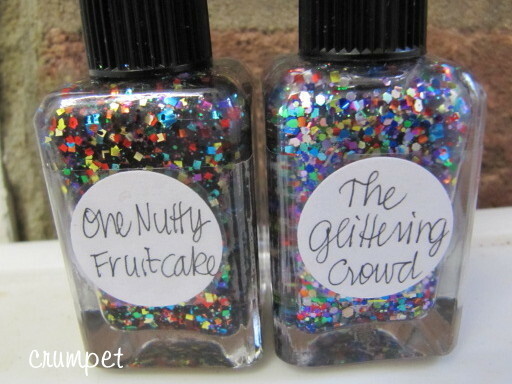 These photos were taken on the 7th May, and I was trying to persuade myself I didn't need both The Glittering Crowd and One Nutty Fruitcake. As fate would have it, just a few weeks later I would be selling both.